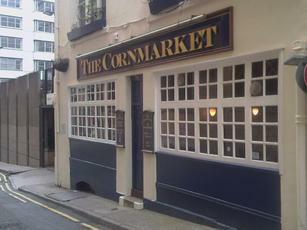 I hadn't been in the Cornmarket for 8 or 9 years. But it's much as I remember it, with a lower bar area that was empty and a larger upper area with space for standing and a few stools around the bar and a larger adjacent seating area. 4 ales were on - Thwaites Wainwright, Purity Pure Gold, Black Sheep Holy Grail & Greene King IPA. All were similar sorts of beers. A dark one would have been nice. Nevertheless, this an atmospheric and comfortable place that is well hidden. I like this place for its good chairs, and their Guinness, a perfect place for a couple of pints and "the Echo"
The friendly staff make the wisit even better. On a recent visit to Liverpool we had to get off the train at St James' station and we came out by the back door and got a bit lost and stumbled on the Cornmarket. It was exactly the same as on our last visit, even, I swear to the same people sitting in the same chairs, rather uncanny. Still the couple of pints went down without too much pain and I was very impressed with the tiling in the toilets,absolutely superb. Nice interior but empty when I visited one afternoon a couple of weeks ago. Barmaid was pleasant enough but this isn't what I'd call a locals pub and not one I'd be in a hurry to visit again. As others have mentioned it is mainly for the office workers in the vicinty. They must be on a good wage though because it's close to �3.00 for a pint. On entering one would expect a cosy snug but the place opens out into a baronial mansion's sitting room; wood panelling and all. Good selection of ales but not a traditional pub as such. You get the feeling that the office workers from the surrounding buildings flock in. So week-end lunch-times or early evenings are more relaxing.